We have a mission: help people find the right furniture for small houses or tiny flats. A new product must always respond to the needs of the modern home: new apartments are smaller and smaller and organization of spaces becomes key. Thinking of the needs of the people who live there, we have added a brand new extending console table the existing range of space-saving furniture. 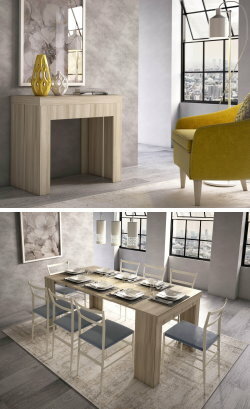 Easy measures only 52 cm in depth but turns into a 148 or 200 cm long dining table, that can accommodate up to 8 people. A versatile and multifunctional piece of furniture, this convertible console table takes up the minimum of space as the extensions are folded underneath the top. A small yet smart detail that will free you from not to know where to put them when Easy is closed. To transform it into a dining table, simply remove the top and pull the structure towards you. Below the top are kept the 3 folded extensions, which make it possible to create a 148 cm table. Simply add the previously removed top to reach a total length of 200 cm. The available colours, white and light elm, perfectly match any furnishing style. Thanks to its streamlined design, Easy becomes a key piece when it comes to furnishing a small living area or an open-plan living room and kitchen. Perfect piece for a hallway, you can use it to drop keys, telephone, wallet or display a vase of flowers and family photos. It only takes a few seconds to convert it into the perfect dining table for 8, for guests and family parties. 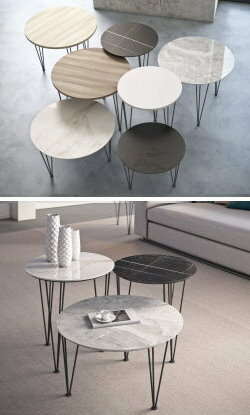 Maconi coffee tables collection, which at present has almost twentyfive different models, welcomes three new living room items: Piramide Gres, Piramide Wood, Piramide Double. A line of living room coffee tables with charcoal black painted tube metal structure and melamine covered wood or marble effect stoneware top. Modern, elegant, versatile; they can be used alone, in set of two, or with other different unique layouts, to express the character of your house and decorate with style the living area. The great new entry: porcelain stoneware. This ceramic-based material is hard, compact, waterproof and has a surface texture that reminds the one of marble. Polished White Gold stoneware inspired by Calacatta marble, polished Orobico Gray stoneware with white and grey shades, polished Sara Noir Black stoneware characterised by white veins and golden touches of colour, matt Natural Iron stoneware with an intense dark colour. Nowadays modern trends are pretty clear: houses are getting smaller, rooms are reduced but at the same time we need the right space for all our activities. 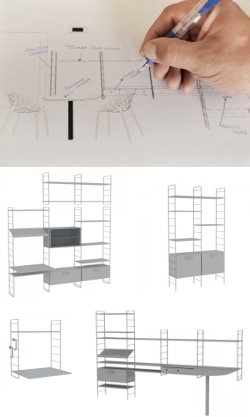 Here in Maconi we started designing intelligent solutions for small houses a while back and we decided to specialise in space-saving furniture pieces. More in specific we studied a collection of transformable multi-purpose single and double beds and a collection of console tables that can turn into tables, desks or ironing boards. 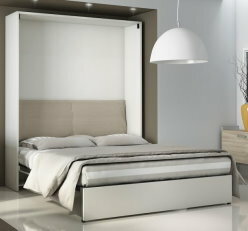 Today, with the measurements of contemporary houses in mind and considering the success of our products such as Link Bed and Link Bed 539 or Living transformable console table, we are ready to propose two new space-saving solutions for the living area and bedroom: Link Bed 538-A and Link Bed 539-A. Two storage units that turn into a single bed, a desk and a dining table. Soon the official high-resolution images and product cards filled with information on measurements, finishes and prices. 18/10/17 - Small house? Space-saving console tables! If you're looking for ways to furnish small houses or one-room flats have a look at our space-saving furniture pieces: a wall mounted console table transforming into a dining table for two; a high storage unit with a reduced depth that turns into a convenient desk to study and work; a wall mounted console table that hides an ironing board; a storage with casters with a single bed inside. The important thing is to use the environment around at best up to the last centimetre and keep everything functional and comfortable. Surround yourself by furniture pieces that can open, close, extend, drop down and transform every time you need. 29/08/17 - Coffee tables: Maconi's got something to suit everybody's fancy! Coffee tables with rectangular, square, round, oval, and even shaped tops. 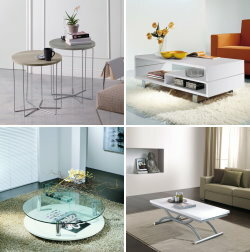 Coffee tables made of wood, glass, metal sheet, or upholstered. Coffee tables that comes alone or in pairs, high or low coffee tables for a front or side sofa position. Coffee tables that are fixed, have storage compartments, or can be transformed into a dining table. Maconi catalogue gives plenty to choose from, and suit all kind of tastes and needs. 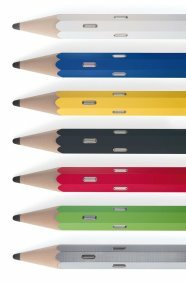 Some models can be also customised in dimensions, finishes and colours. The hallway is your house best calling card, a small space which endures many tasks and a lot of expectations. The entryway of a house has to be practical, functional and handy, and in order to be well organized it must include the following items: coat stand, mirror, shoe rack. Among Maconi collection, you can find the perfect hallway item for a modern house: a piece of furniture with hidden hooks for hats and small bags, a coat hanger rod for jackets and coats, a rectangular full-length mirror, and a top shelf for one or two pairs of shoes. 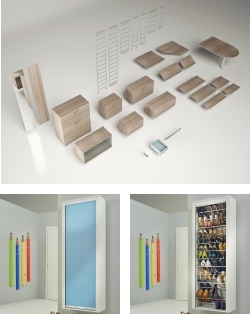 If the environment is big enough, you can keep it even more organized by adding a shoe cabinet with internal shelves. 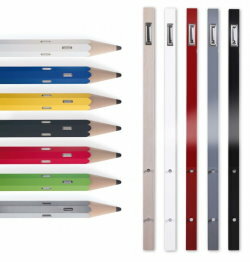 - also ideal to create office and stores shelving solutions. First step: discover all available modules, second step: download the grid and start planning your bookcase. Its a low, long, narrow storage unit - specific measurements cm 212 h.105 d.33 - hiding a single bed inside its structure. In order to use this bed in complete safety the structure must be fixed to the wall. To turn the cabinet into a bed simply lift up the upper side of the front and gently push the structure towards the floor. 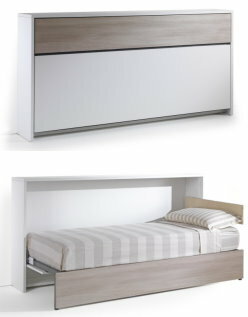 - The bed is horizontal and, once open, it has a very reduced depth of only 99 cm. - It's a space-saving solution that can be used in kids bedrooms, in one-room flats and small houses. - Two different mattress models: memory foam and bionic springs. Despite being quite new in our catalogue, these products immediately received quite a great feedback; honestly we wouldn't expect anything less! They are compact, space-saving, customisable, they belong to Maconi Night and Day collection of hideaway transformable beds. The reasons for such a good reception is quite simple: with one of these furniture pieces you can turn your living room into a bedroom in few simple steps, they are quite small - once closed they are only 33 or 41 cm deep - they are available as a single or double bed, they come with a vertical or horizontal opening, they can be equipped with a sprung or memory mattress, you can also add pillows - choosing among memory, foam and fibre in different colours - they come in streaked white and light elm melamine which are easy to match finishes and are perfect for one-room flats, small house and holiday homes. Link modular bookcase is perfect for any environment of the house or office. 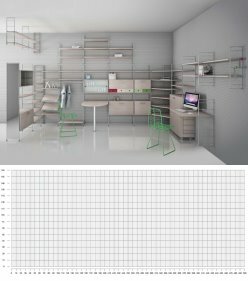 This modular shelving system is composed of metal columns upon which you can install shelves, desktops, storages and drawers in the quantity you prefer and choosing the most suitable layout for your needs. You can create living room wall systems, TV stands, modern hallway furniture, wall bookcases or partitions to divide your house environments such as living room from the kitchen or a bedroom from the home office. Creating your own layout is quite simple, just take measurements of the space you have at disposal, choose all the elements you need and draw them inside the grid. Our Partner Retailers will be more than happy to help you finalise the composition. As you know we are always looking for new space-saving ways to organize at best every single corner of your house and in particular to help all those people that are in the process of furnishing small flats or environments. We came out with this Night n' Day new collection to satisfy the needs of those living in one-room flats or furnishing second or holiday homes. Space-saving furniture pieces with a single or double bed inside: Night n' Day products are smart, small and extremely convenient. Easy to open and close they are perfect to add extra beds wherever you need, without taking up too much space. A standard single bed can also measure 90 x 190 cm whereas a double bed for your guests has to be minimum 140 x 190 cm. With a foldaway bed these measurements are reduced to just a bit more than 40 cm once the bed is closed. The bed will be visible only once is out, whereas the rest of the time you can freely use the whole space at disposal. 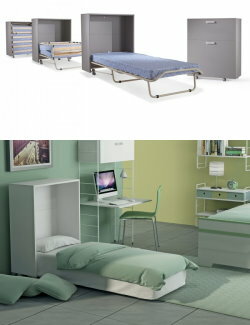 Have a look at all the models available in our Hideaway Beds department. The Night and Day is coming soon! Cabinets with single and double beds, with folding cots, folding and hideaway beds, pieces of furniture convertible into beds with slatted bases and mattress included, living room items convertible into bedrooms, ideas for living rooms with night areas, wall systems with hideaway beds. All these convertible and hideaway solutions are designed to furnish studio apartments, small houses, holiday homes, students accommodations. This pieces of furniture are also ideal to be used as extra guest beds. Take a 66 cm wide and 210 cm high wood panel covered in white, taupe, light elm, dark elm or Canaletto walnut melamine, equipped with lower and upper brackets. Fix this panel in the corner of your hallway. 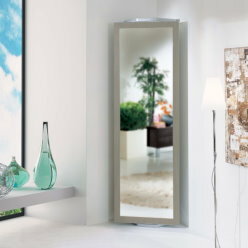 Rotate the panel by 360° and discover a full-height mirror on one side and four coat hooks on the other. That's Twister T02, a swivel and two-sided mirror with a taking up only 42 cm, with a maximum encumbrance of cm 74. Twister T02 is perfect in an entryway, used as a mirror and coat hanger, convenient if you want to give yourself a last look before going out or to hang coats and scarves once you're home. Twister T02 can be placed at every unused corner; also in the bathroom or in a bedroom. Use it to hang your bath robes, clothes, look yourself in the mirror or put some make up on. 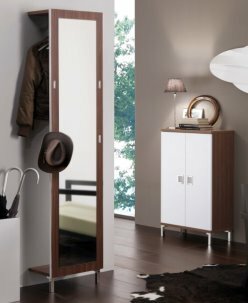 Among our wide range of modern hallway furniture you can also find some smart and multi-purpose solutions: our hallway cabinets with ironing board. We are not talking about classic cabinets with folding ironing boards but real storage units with drop down ironing boards. By pulling out the ironing board you'll get a suitable surface to iron and three chromed metal shelves where you can place an iron station with a reduced weight, ironed clothes or some detergent products. 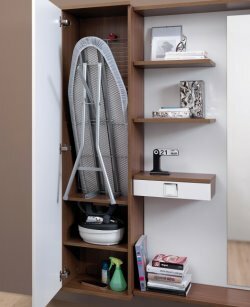 The foldaway ironing board is equipped with a leg and can be hidden behind a door with hinges or a sliding one, according to the chosen model. The lower part of the cabinet features a shelf an can be used to put away several items. 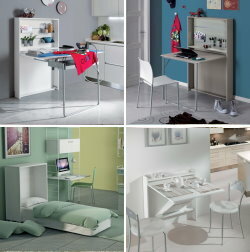 Have a look at Family F06: hall furniture with ironing board, storage unit, shelves and drawer. 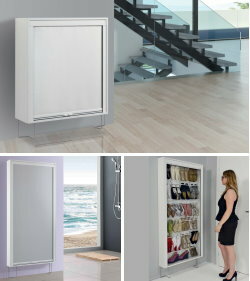 Have a look at Family F17: hallway cabinet with hooks for clothes, ironing kit, shoe rack. A mix of mirror and coat hanger. Have a last look in the mirror before going out and at the same time have some extra space for your jackets, scarves and other small items. The mirrored surface helps get the impression of a bigger room, the hooks help you keep everything tidy and organized. Choose a mirror with coat hooks for a useful furniture item with a double function. This kind of item is perfect in every room of the house: according to the space at disposal and the use it is possible to choose models with different shapes and measurements. You can find wall mounted solutions for small rooms or bigger layouts - also free standing - specifically designed for wider environments. 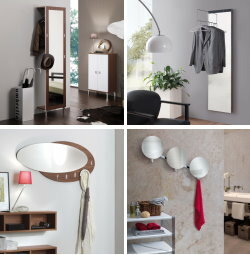 Have a look at all Maconi mirrors with coat hooks. If you are looking for a small, compact shelving system which is at the same time essential in style and multi-purpose you are in the right place. 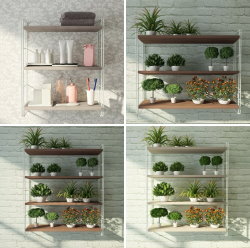 Mini Link is composed of chromed metal or white painted rods and 3 or 4 wooden shelves; it is perfect not only for every corner of the house but also for a garage or the office. In the kitchen it can be used to store jars with spices or dishes and glasses, if you prefer to put it in the bathroom it can hold beauty and make up products, on the other hand inside the laundry room is useful for dust cloths and detergents; in a garage it helps keep the tools well in order, on a balcony it can be used for plants and vases, in the office can hold documents and in a living room it serves as a small bookcase, use it for books and various items inside a home office or in a kids bedroom for toys. Find out Mini Link shelving system with wooden shelves. Roll is a slim shoe rack, extra slim - only 17 cm deep. It has been specifically designed to furnish small spaces, thus it is perfect for corridors, behind a door or in a tiny hallway. The smaller version can contain up to 17 pairs of shoes, if you have more space at disposal you can opt for the bigger one which is higher and comes with a depth of 29 cm; this version can hold up to 50 pairs of shoes. Please remind these numbers are approximate and they can vary according to the shoe model and size. This slim space-saving shoe rack also features a particular mechanism allowing the opening: it comes with a glass fibre shutter with a fabric effect in white, grey, sand and light blue. If you need a furniture item that takes very little space you can also think about the wall mounted version which is also available with two thin high "L" shaped chromed metal feet. Original and funny, these coat racks come with a vertical design to take up little space in width and depth, they are useful for your coats, scarves and bags. We're talking about Matità and Liolà. _ the assembling is easy and safe. A well organised hallway is the perfect welcome for your guests and at the same time is a practical and convenient solution for those who live everyday in that house. If the space at disposal is not that much you can choose compact furniture pieces with reduced measurements which allow to equip at best the wall at disposal. We are talking about panels that can be wall mounted or placed on the floor that can be equipped with mirrors, hooks for coats and clothes as well as shelves. The reduced depth of these solutions are perfect for small narrow environments, in utility rooms or tiny corridors and entryways. - Astor A12: panel with mirror and two clothes hooks. These solutions belong to a collection of customisable modern hallway furniture coming in several measurements, finishes and equipment. In a small kids bedroom you only don't have enough space for a typical desk with a chest of drawers. If you don't want to make your kids renounce to this important elements, you need to make the best of the space available and consider different solutions. 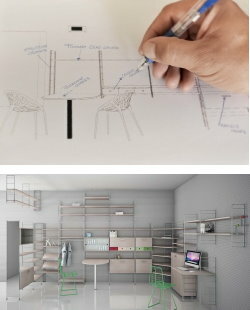 - a wall mounted desk. These two pieces of furniture become real work stations equipped with all the basic elements essential to study and work. A top to lay down your pc and laptop, other small shelves to have books and writing materials always at hand. Galileo space-saving fold-away desk can also be equipped with the following accessories: mail holder to store small paper sheets and documents, cd tray, storage tray, pen holder, and a led light bar. 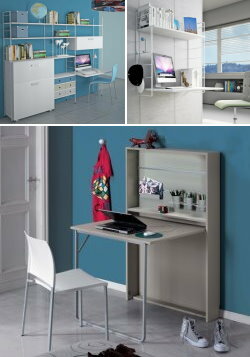 Link wall mounted desk is instead available with 2 or 3 shelves, and also in a floor standing model. This product belongs to Link collection, a modular system that allows you to customize every item as you like, for example adding coloured coat hanger knobs. Imagine a system that can furnish every corner of your room... you are thinking of Link. The definition of an innovative modular system does not do justice to it, we should speak of shelving unit for homes and offices, modular bookcase, double-sided partition bookcase, bookcase with desk, hallway furniture, and pc desk. We certainly don't want to cause confusion, but Link is really all this things, and also all of them together. It is a piece of furniture that makes you free to create your own composition, an item able to shape itself in endless combinations and to perfectly fit every room and environment. It all begins with a resistant structure in metallic wire where you can mount shelves, cabinets with doors, desks, tables with peninsula, magazine racks and drawers. Depending on your tastes and needs this element can be placed on the floor, on the wall, in the middle of the room or hanged to the ceiling. Link collection has been included in the catalogue for more than a year but it keeps achieving resounding success and giving so much satisfaction to its designers and users. 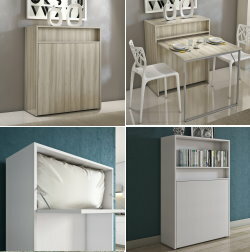 The collection of space-saving furniture has grown to include a new single murphy bed, with slatted base and mattress included: it's not a simple emergency cot, but a cabinet with swivel casters that can be easily moved and placed in every room, and that when needed can be transformed in a single bed with a few simple steps. 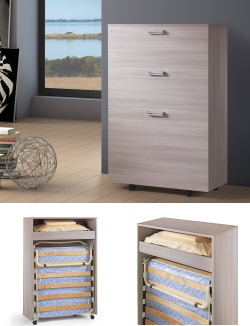 It looks like a chest of drawers, but once you remove the front a folding slatted bed base and a comfortable compartment containing a pillow and a blankert appear. Link Bed 539 is a useful and space-saving furniture item, designed to furnish vacation houses, to have an extra bed in a studio flat, or to furnishin your kids bedroom with an extra bed perfect to accommodate their friends. Link collection allows to integrate the 539 bed in all the shelvings of the system; the ideal solution to create functional and perfectly integrate wall systems. Our collection of transformable and space-saving furniture includes Link Bed, a foldaway bed. 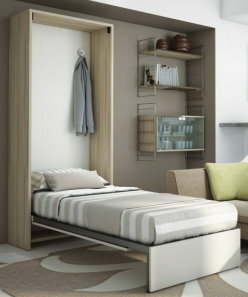 This small article of furniture takes up little room and results easy to be opened thanks to a single drop down door. In addition, it is easy to move it around thanks to very convenient casters. What seems to be a small piece of furniture fitted with casters, is actually a single bed equipped with a wood slatted bed base and a 10 cm high mattress. Link Bed can be basically placed anywhere in the house: suitable in the living room serving as a single bed for last minute guests, perfect as an additional bed in the kids room to host a friend, designed also as an additonal bed in the bedroom. Having a reduced depth of just 35 cm, it can be placed under a staircase, in a recess of the wall or in a free space behind a door. Although designed as a bed for the main house, Link bed results a bright solution for holiday houses or particular hotel facilities. 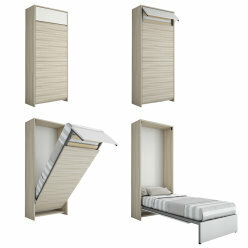 This model of bed belongs to the modular programme Link and can be combined with other elements to create a complete solution for the bedroom. Find out the advantages of Link bed in the kids room. 17/04/2015 - "Awesome! This page is mobile-friendly. 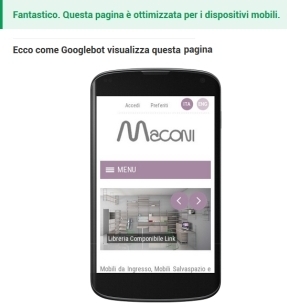 "...Maconi is ALREADY mobile-friendly! Starting from April the 21st, 2015 Google will change some parameters regulating web pages indexing and positioning: they will favour in their indexing all those portals which have been created to be mobile-friendly, meaning that they can be easily read by using smartphones and tablets too. In order to satisfy Google criteria, texts must be readable on small devices as well, they have to automatically adapt to the dimensions of the screen and allow a vertical reading without having to horizontally scroll the page. Clicking on links has to be of course easy, with a simple touch, and images zoom has to be compatible with the system used by mobile phones. We're ready or better: our website www.maconisrl.it "was born ready", also thanks to the know how of Area D. Srl, our digital intermediary. On the right side please find a screen shot of the compatibility test carried out by using an instrument offered by Google. Great new entries for the new 2015 collection, including the new modular system for shelving units called Link. Our production has always been mainly characterized by modular and space saving solutions, with a special focus on hallway furniture and accessories. Dealing with a wise and correct partition of the house spaces has always been a great concern for us and, with this in mind, we came out with Link modular bookcase: versatile and perfect to use every corner of the house to the last centimetre. The design has been inspired by a classic of Scandinavian design of the 40s created by Nils Strinning. The result is a system of modular shelving units characterized by a minimalist style, an extreme functionality and the absolute freedom of obtaining floor standing, wall mounted or ceiling fastened compositions. Link can turn into whatever you want: office shelves, home office with desk and storage to keep all the documents and projects well organized; partition wall for an open space where we want to keep the kitchen and living room separated: wall system with TV stand and PC stand; furniture for a store; hallway furniture; kids bedroom furniture. To meet all your needs and to furnish both home and working environments, we featured Link with accessories such as storage units with glass sliding doors or wooden drop down doors: oblique shelves ideal to display books, magazines or brochures; drawers and working tops to use as computer stands, but also peninsula tables perfect for a professional studio or a kitchen. Our transformable and space-saving furniture have been designed to offer practical yet appealing solutions to organize your house. It is often necessary to see them in action though, to fully understand their potential. That's why we decided to add a Video section with a practical demonstration of how to use coat hangers, shoe cabinets and extending console table. The key word is "transformation": with just a few simple movements the furniture pieces can change, other than their own shape, the environment around. All the things a static photo can not convey have been turned into a short and useful video. A while ago we gave you a short preview of our new entries... now the collection is finally online. Our offer has been enriched with new products to furnish every corner of the house; from the living area to the night one including the hallway. Our hallway furniture models remain unchanged yet we added young and trendy new finishes: light elm, dark elm and taupe. Among the coat hangers and mirrors you can now find colourful hooks and decorative mirrors. For the living room area we came out with new coffee tables made of metal plate and others characterized by the pleasant combination of metal and coated wood. As announced earlier this year the real new entries are a shoe rack and a completely modular system. Our Roll shoe rack is space-saving, slim and capacious, it is equipped with a shutter in coloured fabric with automatic roll-up system. Available in several sizes it can contain approximately from 17 to 50 pairs of shoes and it can be placed on the floor with feet or wall mounted. Link modular system of bookcases allow you to compose your own custom made solutions. By assembling the single elements you can obtain bookcases, wall systems, hallway cabinets, desks for bedrooms, kids bedrooms or home offices, or simple multi-purpose shelving system for every environment of the house. 26/09/2014 - New Collection: Coming Soon! The new collection shown at Milan 2014 Salone del Mobile is almost here. Among new products and finishes updated according to the current interior design trends, we also have two great news in store: first of all a completely modular system for bookcases, shelving systems for houses or home offices coming with endless possibilities. The system is composed of metal columns to place on the floor, on the wall or ceiling. Your spaces can be used up to the last centimetre, and they can be equipped with a variety of accessories: shelves, storage units, small drawers, desks and a peninsula table. The minimalist design characterizing this system is inspired by the original modular bookcase created in 1960 by Scandinavian designer Dieter Rams. The shoe cabinet collection too has a new innovative model created with the highest functionality in mind. Once again a space-saving solution which matches the highest performance to a very small space. The shoe rack is available in two depths and two widths, wall mounted or floor standing, designed for high heel shoes and big size shoes as well. 23/06/2014 - The New Maconi website is online: new design and an innovative approach to products. 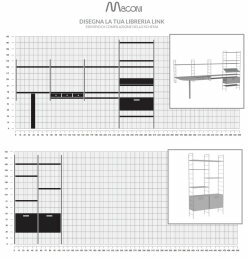 Maconi Srl is proud to present its new website www.maconisrl.it. Designed on a user friendly intuitive approach, it offers a thorough insight into our products, with many high definition photos and lots of information. Our wide range of products are organized into three departments: Hallway Furniture, Space Saving Furniture, Home Accessories. Thanks to multi-level menu and filters finding what you are looking for it's fast and easy. Dedicated pages describe each products with a thorough insight on technical characteristics, tips on how to use them, and a unique Configurator. Through this tool you can display and choose sizes, finishes and possible modifications. To save selections you can simply add them to the wishlist and print them as you need them. Another useful tool allows to book an appointment with an interior designer at one of our Partner Retailers in Italy. Just enter the Retailers website section to find the nearest retailer and receive the best assistance and excellent professional advise.